I have been reading ‘Print is Dead – Books in our Digital Age,’ by Jeff Gomez and have now completed my reading of it. The final chapter ‘Will Books Disappear?’ asks the obvious question concerning books in a digital future. The answer is both yes and no I think. Certainly books will still be around for the foreseeable future – niche products, throw away copies, second-hand books, collectors items, etc. However, traditional book production will certainly slow and far fewer will be printed and distributed in the ‘traditional’ manner. In the digital age, Print on Demand services may grow and maintain popularity for a period, with services like Google Books allowing the ability to print an out of print work cheaply and quickly. Allowing these works to also be accessed via the World Wide Web and in ebook format will limit the use of this technology I would think. With the content of books still being the main resource, employment around the content of books should also remain. The need for editors, publishers and the like, will still be required for excellence in ebook production. The quality of books should continue undiminished, though there will also be avenues for lesser quality works via the World Wide Web. So the book will not disappear, only its appearance will be transformed and the content remain the same. ‘Print is Dead – Books in our Digital Age’ covers no new ground, but it does cover the same ground of the traditional book versus the ebook very well. It presents its case and does it well. Traditional book champions will more than likely remain unmoved by the arguments of Jeff Gomez and those that herald the arrival of ebooks will probably agree with the sentiment expressed in the pages of this book. I believe ‘Print is Dead’ presents a very balanced argument for ebooks in the digital age and presents a future for books that is upon us, in inevitable and that offers up some wonderful possibilities if we are willing to embrace them. I would recoomend this book to anyone interested in the traditional book versus ebook debate. I have been reading ‘Print is Dead – Books in our Digital Age,’ by Jeff Gomez and have now reached ‘Readers in a Digital Future.’ In this chapter Gomez begins to expound the possible future of the digital world for book readers. It is a world that abounds with possibility and an experience of reading that bibliophiles of the past could only dream of (if they could look passed the traditional book format). The book reading future will allow the reader to carry an entire library on a personalised device that can be accessed anywhere and at anytime, with the ability to interact with other digital sources of information and other readers from around the globe, to share insights and to communicate via chat and discussion functionality on book-based social networks, web applications and sites. The reader will also be able to store notes within the book that will be able to be edited and shared, to highlight text, search within a document or an entire library and even expand his/her own library seemingly endlessly. The possibilities and richness of the digital future for bibliophiles is incredible to think about and should be within our grasp. As the digital future approaches I know it is a future I look forward to being able to grasp with both hands as a bibliophile. My traditional book library can expand no further – I have no more space for it to do so. However my digital library has already grown beyond the capability of a home twice my current size to hold and it continues to do so. Will I be able to read them all – probably not. But they will be entertainment, as well as tools, that I can use as I please and they will provide me with experiences as yet untold. The future of reading looks amazing as it continues to appear and unfold on the horizon and as the first rays of the digital era break forth upon us. Of course, if ebooks are handled poorly by authors and publishers, the rich future of reading that could be, may not be. Many of the possibilities of a digital future could be squandered and Gomez warns us of this possibility. What a wasted opportunity should greed and jealousy stand in the way of a richer reading experience. The reading public also need to understand what it actually costs to produce an ebook and the ebook then needs to be priced fairly and be fairly accessible to the reader across all of their devices. 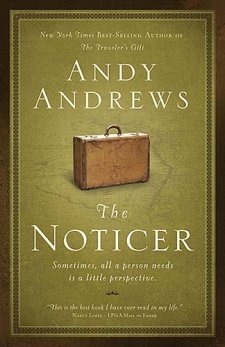 Based on a true story, ‘The Noticer’ tells the story of a mysterious old man known simply as ‘Jones,’ who seems to have the ability to turn up when needed most. In the midst of a crisis, Jones is there to provide ‘perspective.’ Jones is ‘the noticer,’ an individual who notices what is happening in the life of ‘the other’ and provides a little bit of perspective, thereby helping ‘the other’ to understand, grow and move on. However, when viewed from my own Particular Baptist perspective, as heart warming and encouraging as the book is, it is unable to provide that spark that will enable a person to be an effective noticer – that is the realm of the life changing gospel. Yet, in the hands (and mind) of a renewed believer, this book may very well be a vehicle on the road to greater usefulness in being more other-centred than self-centred.